On July 17, 2008, at 1526 eastern daylight time, a Beech A36, N36CL, registered to a private owner, operating as a Title 14 Code of Federal Regulations (CFR) Part 91 personal flight, operating as an Angel Flight, collided with an instrument landing system antenna during initial takeoff climb on runway 5 from Vandenberg Airport (VDF), Tampa, Florida. Visual meteorological conditions prevailed and an instrument flight rules flight plan was filed. The airplane received substantial damage. The private pilot and the two passengers were killed. The flight was originating at the time, and the intended destination was Stuart, Florida. A witness stated he was driving southbound on I-75, adjacent to VDF. The accident airplane was observed taking off on the last one-third of the runway. The airplane landing gear was retracted, and the airplane drifted to the left off the side of the runway. The right wing tip of the airplane collided with a pole; and the airplane cart wheeled to the right, collided with the ground right side up, and immediately caught on fire. The witness reported a light rain and no noticeable wind. Review of the transcript between the pilot and the Tampa east satellite local controller revealed the pilot contacted the controller on the ground at VDF requesting his instrument flight clearance at 1521:39. The controller was unable to locate the flight plan and issued a clearance for the flight to enter into the Lakeland, Florida, airspace at 1522:36, with a void time, to be off the ground by 1530. The last recorded transmission between the pilot and the controller was at of 1523:56, when the pilot acknowledged the clearance by stating, "okay". The pilot, age 81, held a Federal Aviation Regulations (FAA) private pilot certificate issued on July 12, 1996, with ratings for airplane single-engine land and instrument airplane. The pilot was issued a FAA third class-medical certificate on August 28, 2007, with no limitations. The pilot was diagnosed with prostrate cancer since his last medical certificate. He was receiving hormone injections every 3 months with his last injection occurring about 4 weeks before the accident. In addition, the pilot had completed 21 out of 25 external radiation treatments for the disease at the time of the accident. Common side effects from such treatment can include irritation, pain, and other symptoms. The FAA does not specifically note cancer of any sort or treatment as disqualifying. The FAA does not require that medical conditions that occur between required examinations be reported. Title 14 CFR Part 61.53 states that an individual, "shall not act as pilot in command.... while the person (1) Knows or has reason to know of any medical condition that would make the person unable to meet the requirement of the medical certificate necessary for the pilot operation; or (2) Is taking medication or receiving other treatment for a medical condition that results in the person being unable to meet the requirements for the medical certificate necessary for the pilot operation." The pilot indicated on the application for the medical certificate that he had 4,950 total flight hours. The pilot's current logbook was not recovered and was presumed destroyed by the postcrash fire. The pilot's son stated that his father kept his pilot logbook in a black bag in the airplane. The son also stated his father's last biennial flight review was in June 2007. On April 3, 2009, an attorney representing the wife of the pilot submitted a trip report book and four old pilot logbooks to NTSB, ranging in date from 1981 through 2001. The Beech A36 is a six place all metal low wing, single-engine airplane with retractable landing gear, serial number E-1980, manufactured in 1981. A Continental IO-550-B, 300-horsepower engine powered the airplane. Review of the airplane logbooks revealed the last annual inspection was conducted on February 1, 2008. The tachometer and total time on the airframe at the annual inspection was 6,225.9 hours. The tachometer at the crash site was destroyed and the total time since the last annual inspection could not be determined. The total time on the engine as of the last entry in the logbook on May 16, 2008, was 3,527.98 total hours. The total time since major engine overhaul was 186.43 hours as of an engine logbook entry dated April 8, 2008. Penn Yan Aero, Penn Yan, New York, overhauled the engine on April 18, 2007. The engine was returned to Leading Edge Aviation Services Incorporated, Tampa, Florida, and was reinstalled on the airplane on May 30, 2007. The tachometer at the time of the installation was 6,068.55 hours. The last service performed on the engine was an oil change by Leading Edge Aviation Services Inc., on April 8, 2008. The tachometer time was 6,254.98 hours. Review of refueling records revealed Leading Edge Aviation Services Inc. refueled the airplane on July 12, 2008; with 32.16 gallons of 100 low lead fuel. The maximum gross weight of the airplane was 3,600 pounds. Review of weight and balance records for the airplane revealed the last empty weight was recorded as 2,491.93 pounds. The pilot weighed 204 pounds; the center seat passengers combined weight was 308 pounds. No baggage was visible at the accident site. The airplane fuel load was reported as being full which equated to 440 pounds of fuel. The ramp weight was calculated from a Beech A36 Pilot Operating Handbook Weight and Balance Loading Form, page 6-14, as 3,448 pounds. Hawker Beechcraft allowed 12 pounds of fuel burn for start, taxi, and takeoff. The airplane's weight at the time of the accident was calculated to be 3,436 pounds. All weights were determined to be with in the center of gravity limits. The ramp weight of the airplane was 3,448 pounds and center of gravity was 81-inches aft of the datum. The VDF 1522 surface weather observation was: wind 220 degrees at 6 knots, visibility 10 miles, 2,800 scattered, 4,800 scattered, broken ceiling at 7,500 feet, temperature 25 degrees Celsius, dew point 24 degrees Celsius, and an altimeter setting 30.01 inches of mercury. VDF is located at an elevation of 12 feet, 6 miles east of Tampa, Florida. Runway 5 is 5,000 feet long and 150 feet wide with four taxiway intersections. E1 taxiway is located at the departure end of runway 5. E2 taxiway is located 1,300 feet from the departure end of runway 05. E3 taxiway is located 2,900 feet from the departure end of runway 05, and E4 taxiway is located at the departure end of runway 23. The runway glide slope antenna is located 3,461.42 feet from the runway 05 threshold. The distance along the runway to a position on the runway abeam the glide slope antenna is as follows; E1 taxiway is 3,450 feet and E2 taxiway is 2,150 feet. The pilot's takeoff roll start point on the runway was not determined. The airplane was located adjacent to runway 5 at VDF. Examination of the crash site revealed the propeller and nose gear door of the airplane collided with the top of a 49-foot tall instrument landing system (ILS) glide slope antenna. The antenna was located 212 feet left of the centerline for runway 5 and abeam the precision approach path indicator (PAPI), which was located on the right side of the runway. The antenna was laying flat on the ground in the direction of the flight path of the airplane. Nose landing hardware and the remains of propeller blade tips were located 61 feet 8 inches down the crash debris line (CDL). The airplane right wing contacted the ground 254 feet down the CDL. 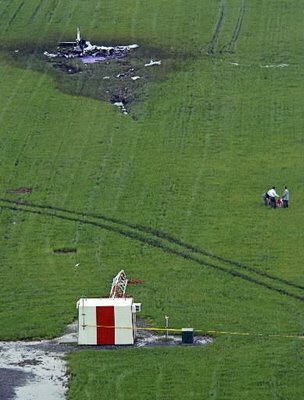 The airplane nose contacted the ground 265 feet down the CDL. The propeller assembly separated and was located 295 feet down the CDL. A separated outer right wing panel with a radar fairing was located 350 feet down the CDL. The airplane came to rest on a heading of 220 degrees, 377 feet down the CDL. Examination of the airframe, flight controls, engine assembly, and accessories revealed no evidence of a precrash mechanical failure or malfunction. The State of Florida District Thirteen Medical Examiner at Tampa, Florida, conducted a postmortem examination of the pilot, on July 18, 2008. The cause of death was suffocation due to inhalation of superheated air. The Forensic Toxicology Research Section, Federal Aviation Administration; Oklahoma City, Oklahoma performed postmortem toxicology of specimens from the pilot. The results were negative for carbon monoxide, cyanide, ethanol, basic, acidic, and neutral drugs. The State of Florida District Thirteen Medical Examiner at Tampa, Florida, conducted a postmortem examination of the female and male passenger, on July 18, 2008. The cause of death was suffocation due to inhalation of superheated air. Mercy Flight Southeast, Inc. (Mercy Flight) received a telephone call from the female passenger in the accident on July 11, 2008, requesting a repeat mission for cancer treatment in the Tampa area. The mission was received and posted on a private internet web site available to Mercy Flight volunteer pilots. The mission request was a short notice request and the Mercy Flight staff contacted 9 pilots on July 14, 2008, in the area to make them aware of the availability of the mission. All nine pilots including the accident pilot turned down the request. The accident pilot called Mercy Flight later in the day after rejecting the flight and accepted the mission. A proposed "Mission Itinerary Form" was transmitted to the pilot on July 15, 2008. Mercy Flight Southeast, Inc. formerly went by the name Angel Flight Southeast, Inc. The name was changed on January 16, 2007, and the organization continued operated using the call sign Angel Flight. The pilot had flown 36 missions since May 2004. He completed his annual Mercy Flight membership renewal on April 4, 2008. The pilot reported on his renewal that he was a private pilot with an instrument rating with 5,010 total flight hours. He further reported that he had no accident history or FAA enforcement within the last five years. In addition the pilot indicated on his renewal that he had a current medical certificate and that he met all currency flight requirements. Review of a Beech A36 Pilot Operating Handbook, Section 5, Performance, Take Off Distance Chart, at Page 5 to 18 revealed, an airplane weighing 3,450 pounds departing from a sea-level airport with an outside temperature of 25 degrees Celsius with no wind will break ground after a ground roll of 1,100 feet, and to clear a 50-foot obstacle, 2,100 feet is needed. With a 6-knot tailwind, the airplane will break ground after a ground roll of 1,450 feet, and to clear a 50-foot obstacle, 2,750 feet is needed. Can someone explain why there are so many different lines to a checkpoint?